I saw the Apple Watch announcement and was so impressed that I immediately ordered a real watch. No, it's not a Rolex. I's a Steinhart. German engineered with a Swiss movement, but that's not the point. I have not worn a wristwatch in years but coincidentally have been thinking about going back to one. And admittedly I was looking for something rugged that did not require batteries. Why do I not like the Apple Watch (Isn't it interesting that it's not 'iWatch'.)? Do I think the Apple Watch will ultimately be successful? Yes, but not because of anything it can do today. It will be successful because some entrepreneur will create a to-die-for app that runs on it. I am a ham radio operator (callsign WB7OBG). I keep a radio tuned to a local UHF FM repeater most of the time, and most of us who use it know each other to some extent. Think of it as a little community. We even get together in person about once a month. Everyone in this little community is an equal. We use our radios and the repeater to converse with each other about a variety of topics, most of which are not even related to ham radio. We all have an equal voice (though the repeater's owner is a 'little more equal' than the rest of us, I suppose). Contrast this with the local AM or FM broadcast radio station that you probably listen to: The only 'voice' or 'message' is that of the broadcaster. Unfortunately, there is a tendency by business owners to use social media like AM/FM broadcast instead of 2-way radio. They bast out their marketing message on their blogs, Facebook, Twitter, etc. They never listen for feedback or dialog. They may even have outsourced their entire social media activity to a third party. Which is a shame. Using social media solely as a broadcast medium reduces it to the level of junk mail. When's the last time you paid attention to a piece of junk mail? This is not to say that you should never mention your latest product or service - it means that it shsouldn't be the majority of your content. You'll never build community and create conversation by talking exclusively about your product. Do Home Page Sliders Actually Hurt You? Further evidence that my gut-feel campaign against using 'sliders' (also called image rotations or slideshows) is on the right track. This is from an excellent website called WhichTestWon.com that performs A/B testing of verious website functions and features. The version on the left used six static images on the home page. The version on the right used a slideshow. The version on the left had a 187% higher click-through rate and increased sales by 75%. Slideshows are OK if they are used as an 'accent' feature, but if you try to use them to present facets of your sales or marketing message you are probably doing yourself more harm than good. Website viewers are not going to wait around to view the whole thing in hopes that one of the slides resonates with them. Designers love sliders. but you should engineer your website for revenue. This morning I needed to call a tow truck for my son's car. I knew the name of the towing company and back in the dark ages I would have looked them up in the phone book. Guess what: I no longer even own a phone book. Today's answer is to Google them and copy the phone number off the website. 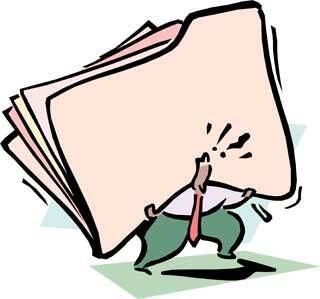 Message: Even if you are a legacy business you need a web presence to at least replace your old phone book entry. Why I Think Facebook Is Doomed. If you are a photography buff and own a Nikon then Nikonians is the place for you - A vibrant community full of the entire range of people from experts to beginners all passionate about their topic and eager to share and talk about it. Play the banjo? There is a community for that. There are communities for cooking, hunting & shooting, and learning a language. There is even a community for people who raise chickens. All of these communities have one thing in common: They are full of conversation and knowledge. Each time I visit Nikonians I learn so much and come away feeling enriched. None of these communities are on Facebook. Pick a topic and try to find a vibrant group on Facebook for it. In fact, there doesn't even seem to be a way to find people who share your interests. And even if you could find them and 'friend' them, most of their Facebook posts will have nothing to do with your specific shared interest. Facebook used to have a Discussions tab you could add to a page. That function was removed a long time ago. In fact, Facebook is devoid of the structure necessary for people to gather around a common interest and focus on it. Perhaps this is why so many people feel that Facebook is a waste of time. The message here for small business owners is that you need to think carefully about what you are trying to accomplish with social media. Sometimes Facebook is the perfect tool. Sometimes it is not. That's right. As of Wordpress 3.2 IE6 will no longer be supported. I think that is a bad move. I know of some very large corporations for whom IE6 is the one-and-only standard. I fear this may cause a lot of trouble. If you have been around me for any length of time then you know that I am a strong proponent of developing Buyer Personas to help you reach the right people at the right time with the right message. Much of what I advocate and practice has been learned from Adele Revella. Here's your chance to get 30 minutes of free consulting from the preeminent thought-leader and practitioner of buyer personas. A few weeks ago we evaluated several wordpress mobile plugins and Wp-Touch Pro edged out the competition. We've been playing with it for several weeks and we were about to go live with it on a client's site. WP-Touch Pro couldn't be activated.Stymied, I went to their support site and saw that it was dark. Here is a company that obviously has other higher priorities than its customers. A recent post on Everything Typepad informs us that TypePad's Widget Gallery has been pulled down. I know I'm not alone when I wonder if we're seeing the decline of TypePad. Turnaround time on help tickets now seems to be about 72 hours. It's been nearly two weeks since I sent my email to TypePad's new GM and I've not received a response - a world of difference since the days when a comment on Twitter would prompt Anil Dash to call me on the phone. The other day I made a foray into TypePad's Advanced Templates to see if we could use them to solve a specific customer's problem. While the documentation for Advanced Templates was never great, almost all of it has been removed. Advanced templates are now pretty worthless. All this leads me to worry that TypePad's best days are behind them. Douglas Rushkoff posted an interesting article a couple of days ago predicting that Facebok's days are numbered. It's an interesting article and worth reading. While it's inevitable that Facebook will fade eventually, I don't see that happening in the foreseeable future. MySpace, AOL, et all declined because (1) they failed to continue to innovate as an earlier commenter pointed out, and (2) there was 'something better' for users to migrate to. I don't see the 'something better' on the event horizon. And my sense is that the innovation continues. My opinion? FB has plans for all those 'Like' buttons we're putting on everything and those plans mean that if anyone should be worried about a decline it's Google. A central Pennsylvania technical college is blocking access to all social media sites for a week. I'd say that someone doesn't get it. Social media isn't just an alternative form of entertainment. It is a fundamental shift in the way we communicate, ask and answer questions, and make decisions. As a foodie, I went to the forums where my fellow fodies hang out and discuss all manner of foodie topics including kitchen appliances. After some online conversation, I came away with the make and model of dishwasher I wanted to buy (Bosch Integra 800). Next I went to the Bosch website to find the local appliance dealers who carried it. FInally I went to Yelp to read the reviews of those dealers and pick the dealer I wanted to work with. Thanks to social media, the entire pre-sales conversation at the appliance dealer consisted of "I want to by a Bosch Integra 800". Blocking access to social media is not like unplugging the TV. It's more like chaining the campus library's doors shut. Isn't it ironic that the two biggest names in social media are so disengaged from their customers? A few weeks ago portions of a valuable Twitter application I use suddenly stopped working. Twitter had changed the rules without warning. I and many of my colleagues spend countless hours evangelizing about how to effectively use social media - pull your customers into the processes of developing your roadmap, involving them in your problem-solving. In general being open with your customers. Yet two of the biggest names in social media are so imperious. No, I'm not picking on Wordpress. I just want to point out that you have important things to do. Running your business is one of them. Keeping your blog's software up-to-date to insure that the latest security holes have been plugged should not have to be one of them. That's enough to give even me pause. As I write this, I am doing this upgraded for my main website. I performed the upgrade on my 'staging' website first just to make sure, and now - with anxiety level elevated just a bit - I'm doing the upgrade for the production site. So when people ask me why I recommend Typepad, This Is Why. Or at least one of the reasons why. If you have a TypePad site all this stuff is taken care of for you. Small Business Owners: Consider what you are facing. Not "the worst economy since the Great Depression." Not "the worst unemployment rate in 26 years." You have before you an opportunity that may occur only once in your lifetime. The playing field has suddenly been leveled. Money has been neutralized as a weapon. Last year the 800-pound gorilla in your market had a million-dollar advertising budget and three marketing people, and he beat you up mercilessly with them. He doesn't have them any more. Now it's just you against him. Mano a mano. And he's coming to this battle at a disadvantage. He's still in the mindset of playing by the old rules. You have a new tool available to you: Social Media. It allows you to build your brand and spread your word globally for almost no money. Social media allows you to accomplish what big companies with millions of advertising dollars cannot do. Yes, It takes time and energy to successfully leverage social media, but a ton of time and energy is a lot easier to come by than a ton of money. The playing field has been leveled. Seize the advantage. Google Reader and Google Blog Search appear to no longer be on speaking terms. If I click on "Subscribe to a blog search feed for _______ in Google Reader" at the bottom of the Search Results page, it responds with "Google Blog Search: has no items." Or if I right-click on the "RSS" link in the left sidebar of the Google Blog Search Results page, select 'Copy Link' from the menu and then attempt to add the feed to Google Reader manually, I get "No feed available for ________________"
It's pretty pathetic with Google Reader doesn't like the feed URLs provided by Google Blog Search. I am a big fan of the folks at Pragmatic Marketing. They have a new book about to be published called Tuned In. They've had a blog up called Tuned In Blog for a while. We all know examples of companies that are tuned in and companies that are tuned out. A few months ago I pointed out how tuned out Delta airlines is even though they have a pretty active blog. I have another example of a tuned-out company: Williams-Sonoma. A couple of weeks ago, I blogged on my foodie blog about a bad experience I had at the Williams-Sonoma store. Since then no less that five other people from around the country have left comments about their similar experiences. A truly tuned-in company would be monitoring the blogosphere and almost immediately be alerted to any mention of it's name, url, etc. This capability is not just for the big boys. Anyone can set up the same thing for free using a few search engines, Google Alerts, and RSS. A truly tuned-in company would have tried to contact me to ameliorate the problem, particularly since it appears their customer-service problem is widespread. DId I hear from Williams-Sonoma? Nope. Tuned Out. Let me emphasize this: This is how little companies can eat a big company's lunch. It costs nothing to set up a good reputation monitor except a little time. It takes only a few minutes per week to use it. When you find someone who has said nice things about you, thank them. When you find someone who has had a bad experience, here is your chance to fix it - and even turn the situation around - before any real damage is done. With a little effort, you can even turn that disgruntled customer into a raving enthusiastic fan. Remember the Chrysler TC? It was supposed to be Chrysler's image-building flagship. Lee Iococca had it built in Milan, Italy and tried to convince us it was a Maserati. Savvy American consumers were not fooled: Underneath the Italian leather and nice wheels it was just the same old K-car - a Chrysler LeBaron with a thirty-thousand dollar price tag. So it is with a lot of businesses these days. Only instead of some fancy Italian leather or expensive wheels, they put up a blog. By doing so, and spouting a few social media buzzwords, they presume that their reputations will be transformed and the pubic will suddenly see them as honest, open, responsive, and customer-focused companies. It doesn't work that way. The blogosphere - and people in general - are smarter than that. It doesn't take very many interactions to discover that under all that fancy social media upholstery, it's still the same old company that thinks things would run much smoother if its pesky customers would simply shut up and go away. My favorite word associated with blogging is 'conversation'. My second favorite word is 'disruption'. That's because for many companies, truly listening to their customers - and then taking action based upon what they hear - is too much of a disruption. It’s easier to keep doing things the way they’ve always done them and ignore the complaints, input - and sometime insults - being hurled over the wall. Delta Airlines is a perfect example. In a recent blog post, David Meerman Scott wrote about his experience with Delta. They not only ruined his family's vacation, Delta's automated email system then proceeded to make matters worse. Now you would think that a company of Delta's size that was truly customer-focused would have mechanisms in place to monitor the web to detect anytime its company name is mentioned. I do it. I teach every one of my clients to do it. Heck, some of them even pay me to do it for them. We understand that if you reach out to that unhappy client quickly, you can not only avoid the problem 'going supernova' as Robert Scoble puts it, you can actually turn that unhappy customer into an enthusiastic fan. Did anyone at Delta reach out to David? Nope. And the number of comments to David's blog post continues to grow with other people adding their own personal horror stories about Delta. (I refrained from adding the story of my own 'adventure' with Delta last fall.) Is it a surprise then that when you type "Delta Airlines" into Google, one of the entries on the first page of results is "DeltaReallySucks.com". "In summary, here you have someone who has been loyal to [Delta] for years and years and is being pushed away by what I believe is nothing more than squeezing every penny of profit out of every seat-mile dollar. There is a limit to what you can take for profit, without biting the hand that feeds. In this case, I have been bitten one too many times." While I appreciate the direct feedback, I am not in a position to resolve specific customer issues." "From some of the recent talks I've had with Microsoft, I'm starting to see more and more people internally beginning to believe a simple truth: That if Microsoft wishes to change the world, then changing themselves is also, most definitely, a big part of the equation." "I'm sorry for the frustration we have caused. I do care and can say there are lots of people working here who feel the same way. I've asked someone from our Customer Service to contact you so that we can work through this situation." All of us business owners need to heed this lesson. When you start blogging, don't just put fancy Italian leather in the same old car. Be willing to air your dirty laundry. If you've discovered that some aspect of your product or service doesn't perform very well, admit it. Then talk about how you are going to fix it. Then fix it. If a customer uses your blog to lodge a complaint, don't metaphorically hide in your office. In fact, pray that someone brings you a legitimate complaint. First of all, that means your blog is working and your clients see you as open, honest, and willing to listen. Once that happens you will uncover problems in your business that you never realized you had. And you can fix them. And your customers will love you for it. Blogging is disruptive. Have the cojones to use that disruption to make your company better. Your customers deserve it. Your Employees deserve it. You deserve it. Be a Dell, not a Delta. We are so over-saturated with advertising messages that we have become immune. My brand new digital video recorder has a button that allows me to skip ahead by 30 seconds. Why would I possibly want to skip ahead 30 seconds, Hmm? Add to that the fact that the quality of content has deteriorated while at the same time the viewer's choices have exploded, and you have a train wreck in the making. Provide as much information as possible about their products or services, do so in an interesting, informative, and engaging way that is not blatant advertising, and deliver it in a manner that is not viewed as an interruption or 'push'. Why don't people talk to their customers more about their general businesses issues, best-in-class service offerings, and things that they wish they were getting from their suppliers that they are not? Dave, you've just described one of the most useful aspects of blogging. A blog can provide all that and more. In ClueTrain we learned that Markets are Conversations. Hugh MacLeod has explained it as well as anyone I know. To paraphrase: Everything inside the outer circle 'Y' is your market. 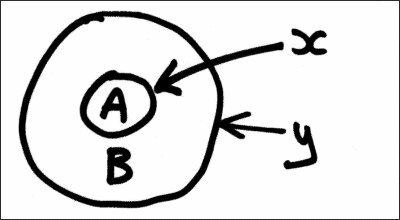 Area 'B' is the external conversation going on in the world about you and your products/services. The smaller, inner circle 'X' representes your company. Area 'A' is the internal conversation going on within your company about your products/services. More often that not, the internal conversation and the external conversation bear little resemblance to each other. For example, you think your product is wonderful; The rest of the world thinks it has a fatal flaw. That circle 'X' acts as a membrane keeping the two conversations separate. You gotta blow holes in that membrane. In Hugh-speak, you must make that membrane porous. If the world thinks your product has a fatal flaw you need to know it. To hide your head in the sand is suicide. Quite frankly, if you are avoiding this conversation because you are afraid of what you might hear then you are committing professional malpractice. Your customers deserve better, your employees deserve better, and you deserve better. Nothing blows holes in that membrane better than blogging. Did that last survey reveal a problem? Get on your blog and admit it! Talk about the problem and what you are going to do about it. WIthin reason, air the dirty laundry. You'll be surprised at the benefits. Once you open up about your fallabilities, your loyal customers will confide in you and you will learn all sorts of things you dind't know before. Not only that, if people are thinking bad things about your company or product, then they are probably saying those same things on a blog somewhere. Set up some search-driven RSS feeds (your 'Driftnet') and find out what other people are saying. This isn't rocket science. It's easy. It's inexpensive. Yes, it takes a little time, but not much. and it's worth it. There's an interesting conversation going on in the blogosphere. The most prominent is Guy Kawasaki's The Top Ten Reasons Why PR Doesn't Work post. "Personally, I have no retort, no counterpoints, no defense, and no qualm, just a suggestion really for those that believe this: go try advertising." Advertising doesn't work either, and I can prove it: Do you subscribe to the daily newspaper? if so, with out looking tell me what was the advertiser in the full-page ad on page 3 (probably the most expensive real-estate in the entire paper). We are already so over-saturating with mass advertising messages that we have become immune to them.